For the second time in 3 days, the city of Memphis and immediate suburbs were largely spared from possible severe weather. As forecast, the vast majority of the severe weather, including multiple tornadoes and 27 reported fatalities as of this writing, occurred east of the metro, although storms along the cold front fired over Fayette and Marshall Counties. Large hail was reported in Grand Junction, Fayette County, from that storm. Below are the preliminary storm reports received by NWS-Memphis today. 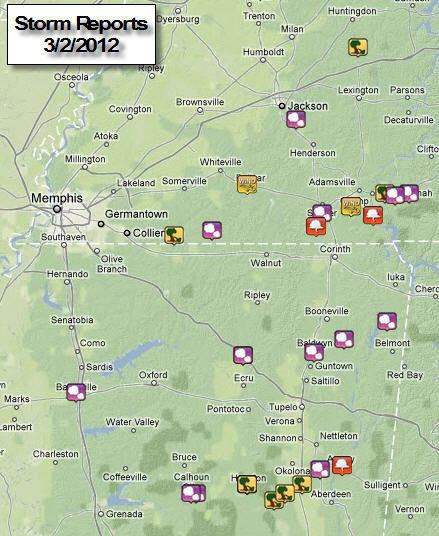 NWS-Memphis preliminary storm reports. 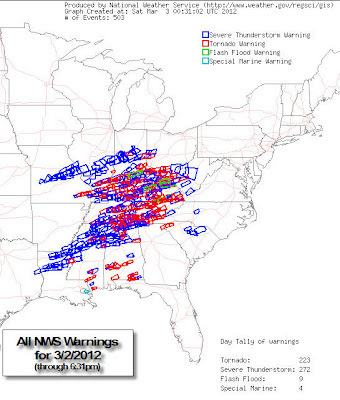 Red = tornadoes; purple = hail; yellow = wind. Heading into today, a widespread and potentially devastating setup prompted the issuance of a rare high risk outlook for central KY and TN and a very large moderate risk surrounding the high risk. The 8:00am outlook from the Storm Prediction Center (shown below) depicts the area of concern. 8:00am severe weather outlook from SPC. The result (as of 6:30pm CST) is shown below in terms of the number of severe weather warnings issued. The warnings were, as expected, largely within the moderate and high risk zones shown above, indicating that the SPC forecasters had a good handle on the area most likely to be affected. NWS-issued warnings through 6:30pm. Tornado = red; T'storm = blue; Flood = green. With the passage of the cold front through the Mid-South at mid-afternoon, a drier and stable airmass was ushered in. High pressure will continue to build in bringing cooler, though not unseasonably cool, weather for the next few days. Certainly much cooler than the record high of 83 degrees that was set at Memphis today!